Amorphous silicon (a-Si) thin-film market share is expected to fall in the near term according to a recent report by EnergyTrend. The prediction is based on a recent string of closures in the a-Si thin-film PV sector, with the latest being DuPont’s recent announcement of plans to terminate its Apollo line of a-Si thin-film modules by the end of 2014. However, DuPont is not the only a-Si thin film player to exit the market. Tokyo Electron and for example, announced the closure of its a-Si tandem technology development program.Amorphous silicon thin-film was once hailed as a key technology for the PV industry and promised the lowest cost per watt in the industry in the days when the price of crystalline silicon PV modules was high thanks to the sky-rocketing price of polysilicon (a raw-material used in silicon PV cell production). In fact, as late as 2012, a-Si continued to command a 30% share in the thin-film PV market (see graph below). Another key reason behind the bleak forecasts is the lack of a-Si technology development due to dwindling R&D dollars. A crucial blow was the termination of the next-generation tandem cell development program by Tokyo Electron, a major a-Si equipment manufacturer (who exited the a-Si business altogether earlier this year!). The impact of reduced R&D on a-Si efficiencies is telling. 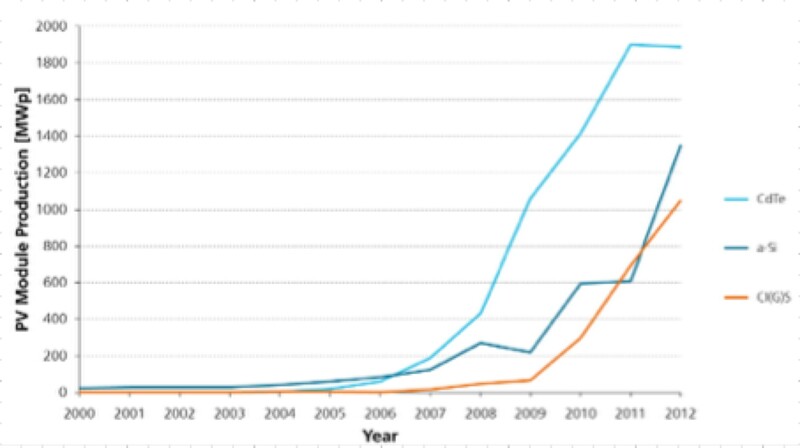 A quick look at the solar PV efficiency chart from NREL shows that the last record efficiency for a-Si technology (13.4%) was achieved by LG Electronics in 2012. In fact, a-Si efficiencies have stayed in the 11-13% range since 1995. This is a glacial pace of about 0.10% efficiency gain per year over the last 20 years! This is in stark contrast to CdTe technology, which is undergoing rapid advances in efficiency of late (1.3% efficiency gain per year over the last 3 years), with a respectable 20.4% record cell efficiency announced just last month by First Solar. 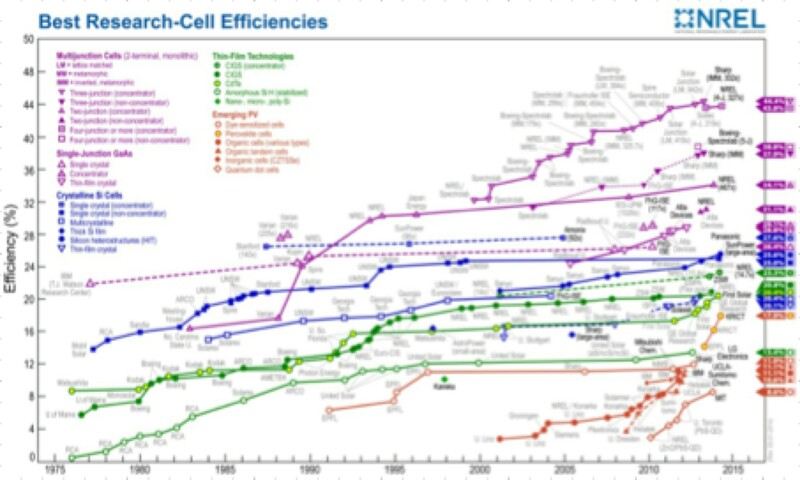 Although CIGS technology has been evolving at a much slower pace (0.15% efficiency gain per year over the last 15 years), it continues to remain the thin-film technology efficiency leader at 20.9% (announced by Solar Frontier last month) thanks to a growth spurt in the early 1990’s. Given the bleak prospects for technology and cost improvements for a-Si and with other thin-film technologies surging ahead to reach parity with traditional silicon PV technologies, there is little hope indeed for a-Si to quickly regain the historical market shares it once enjoyed. Next post: What would a solar system cost without the Renewable Energy Target?